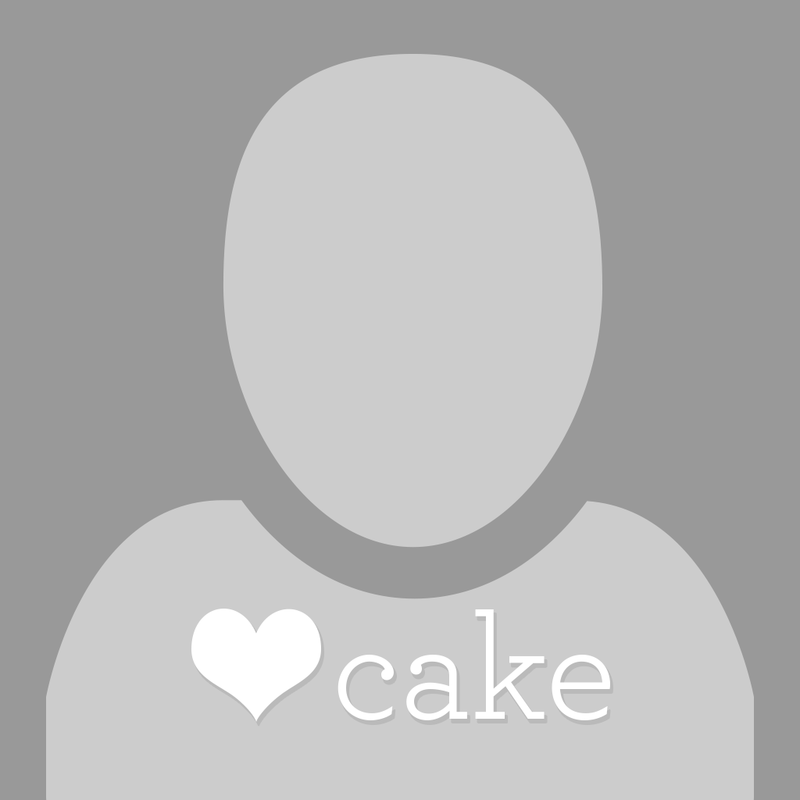 As seen in Cake Central Magazine Volume 1, Issue 6. Succulents, also known as fat plants, are water-retaining plants known for their plump leaves and resilience in harsh climates. 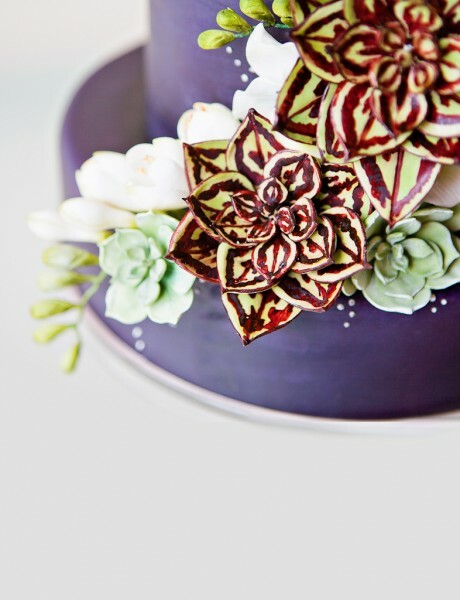 In the cake world, succulents can add variety to cakemakers’ traditional arsenal of greenery decorations. Their assembly is similar to that of a sugar rose in that each leaf is wired individually. 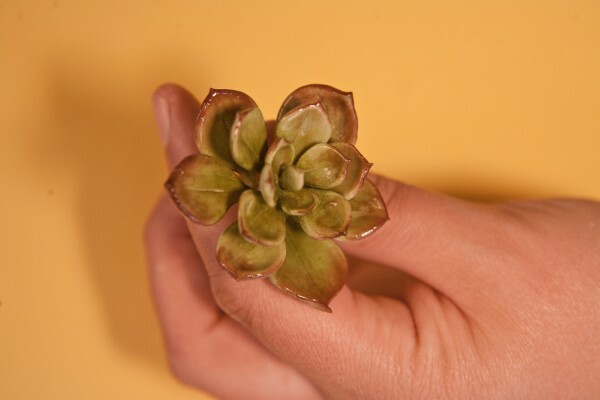 There are typically three rings of leaves on a mini succulent, and up to six rings on larger succulents. When creating your own succulents, it’s important to gather various photos of the plant you’d like to replicate so as to ensure the highest degree of realism. This cake was inspired by a bridal bouquet created by VanLierop Garden Market in Sumner, WA. 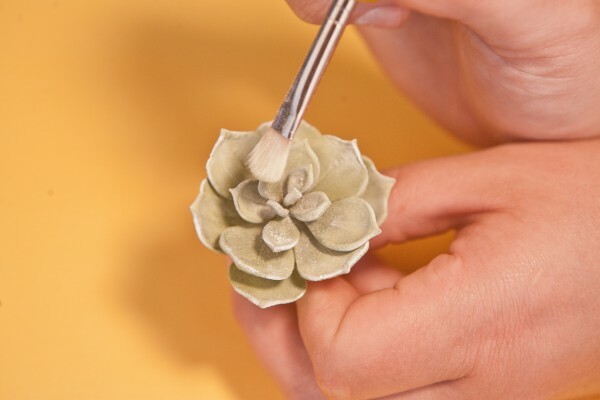 In this tutorial, decorator Kaysie Lackey of The People’s Cake demonstrates how to assemble and paint a gumpaste echeveria. Before you begin, color your gumpaste with avocado Americolor gel, leaf green Americolor gel, and gold Americolor gel. 1. Moisten wire (28 gauge for small and 26 for medium) with egg white. 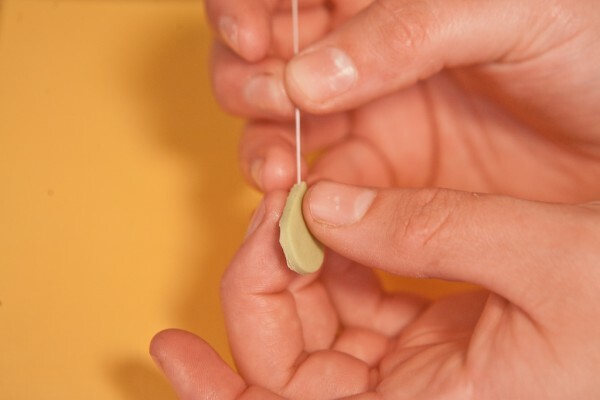 Insert wire into a pea-sized ball of gumpaste, and form into a teardrop with the fat end up. 2. Using your fingers, pinch a point into the teardrop. 3. 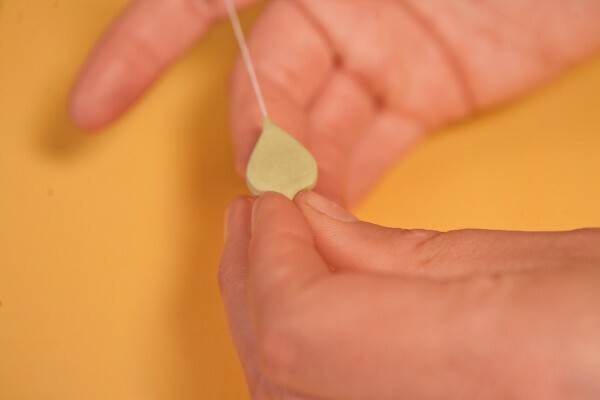 Flatten the teardrop between fingers to 1/4 inch thick. Succulent leaves are significantly thicker than flower petals. 4. 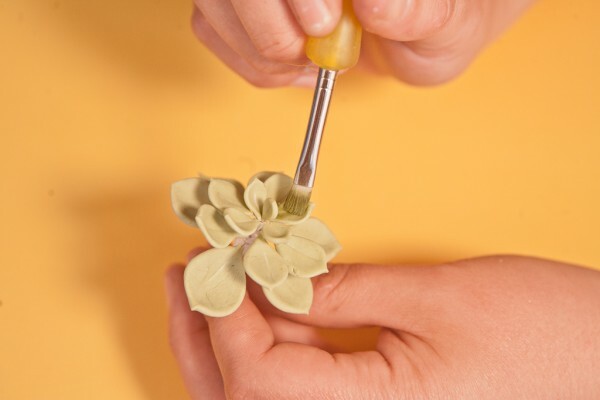 Soften leaf edges with a ball tool on a CelPad, making sure to not thin or ruffle the edges. 5. Indent the center of the leaf. Smooth until center wire is visible. 6. 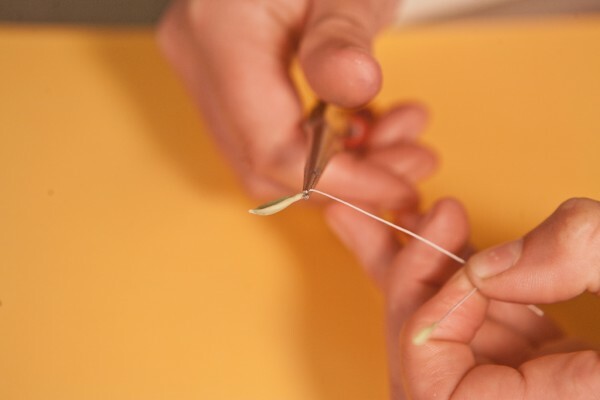 Using your fingers, pinch a thorny point. 7. Repeat until you’ve achieved desired number of leaves. 8. 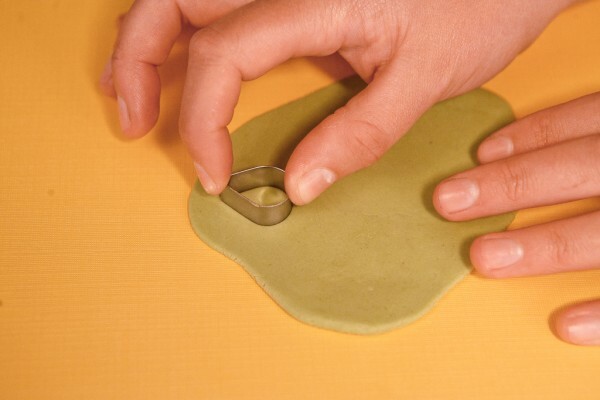 Roll gumpaste between 1/8 and 1/16 inch thick. 9. 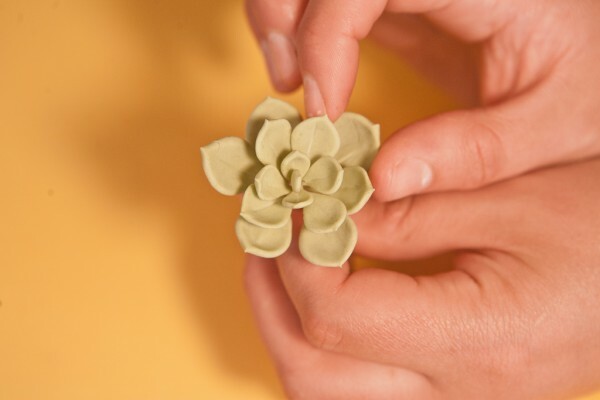 Using a small rose petal cutter, cut a single leaf. 10. 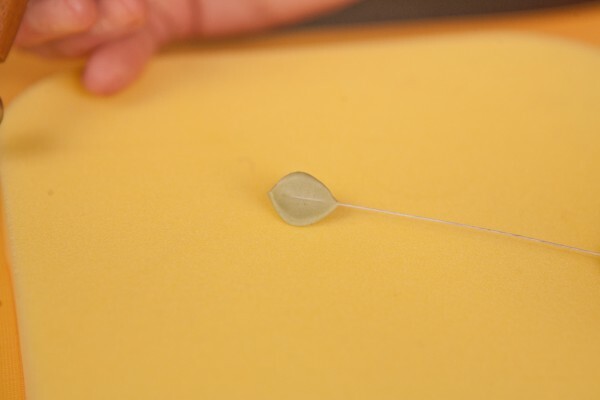 Insert a 24-gauge wire moistened with egg white into pointed end of teardrop leaf. 11. Pinch rounded end of leaf into a thorny point. 12. Soften with a ball tool on a CelPad. Thin center until wire is visible. 13. 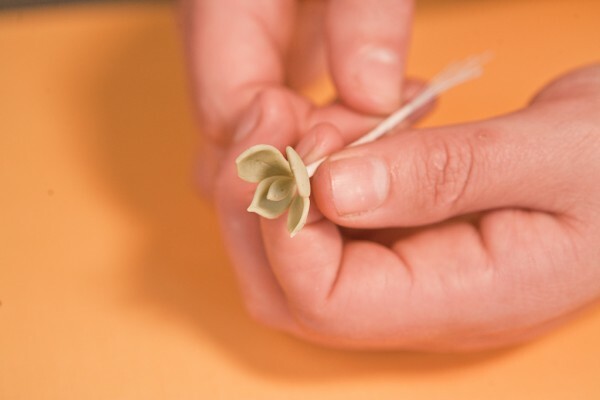 Use your thumb to create a cup shape to the leaf. 14. Refine the tip point. 15. Allow to dry for at least 30 minutes. 16. 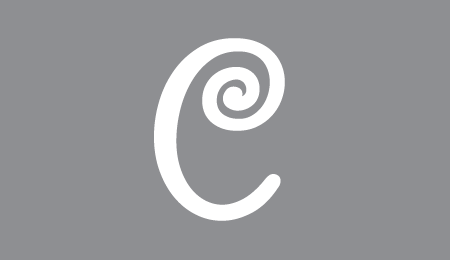 The center leaf stays straight. 17. 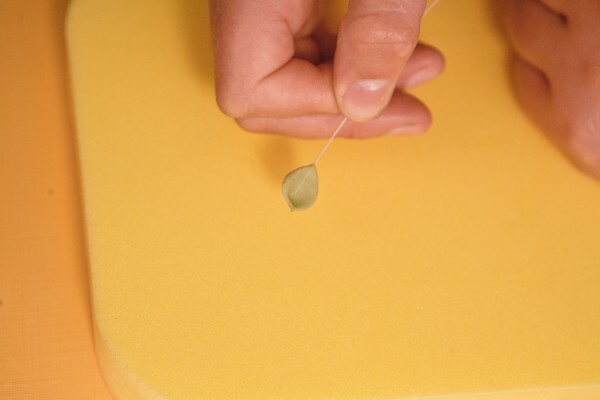 Before attaching the additional leaves, use pliers to bend the wire at the base of each leaf to a 45-degree angle. 18. 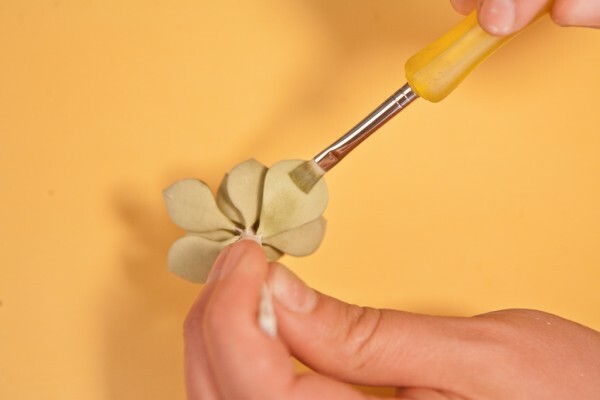 Add 1 leaf at a time to the center leaf, taping securely. 19. Spiral leaves down the center wire to create the first ring of 4 leaves. Once first ring is assembled, tape the whole length of the wire. 20. 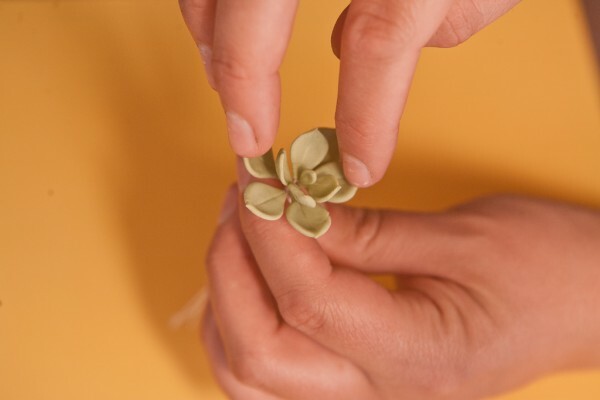 Create the second ring of 5 leaves by taping 1 leaf at a time; stagger to overlap. Tape the whole length of the wire once the entire ring is assembled. 21. Adjust leaves to open the succulent. 22. 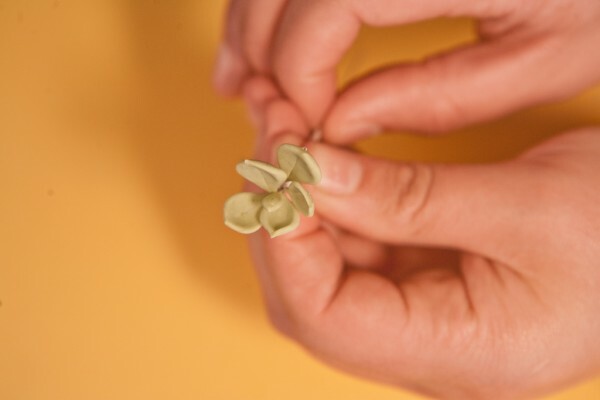 Apply the third ring of larger leaves in the same manner. 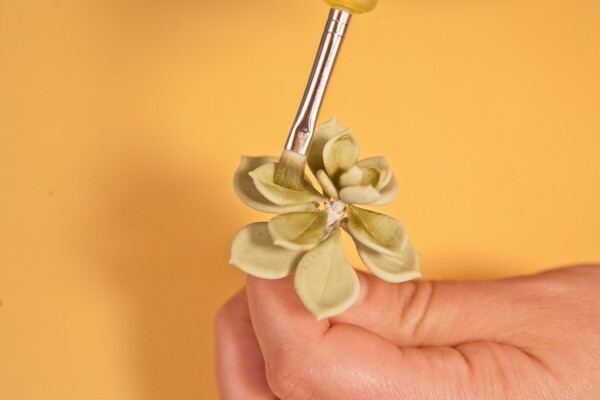 At this point, the larger leaves should have been created with cutters. 23. Mix moss green dust and chartreuse dust. 24. Bend back all leaves. 25. Start painting at the center of the first ring of leaves, and brush outward toward the tip to blend. The paint should be darker toward the center. 26. After each ring is painted, bend leaves back into position so as to get to the next ring of leaves. 27. Repeat until all rows of leaves are painted. 28. After all leaves are painted, flip the succulent upside down and paint the backs of the outer leaves. 29. Paint the back of the tips of the inner leaves. 30. 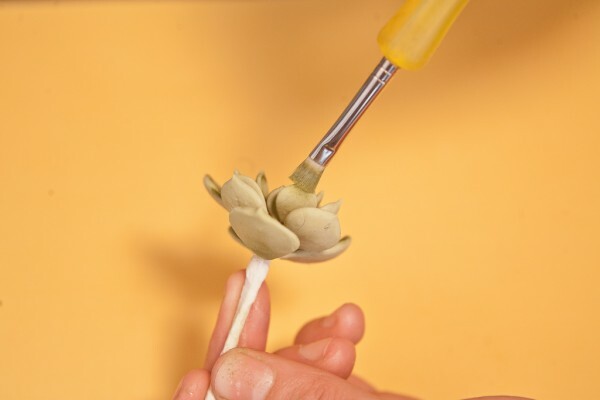 Using a plush brush, paint white petal dust onto the tips and blend toward the center. 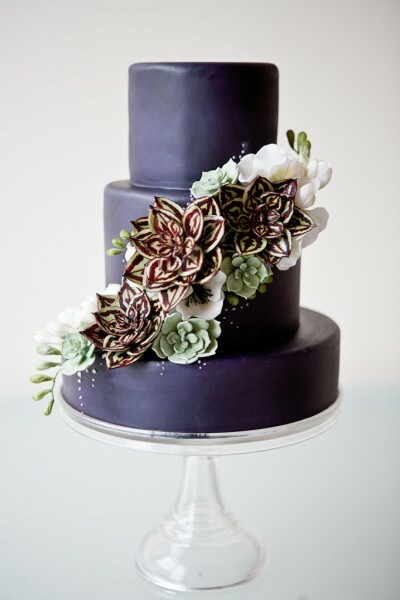 The powder look creates a waxy impression, characteristic of a succulent. Do not steam the succulent, as you don’t want the leaves to be shiny. 31. Starting with outer leaves, apply red velvet dust to the outer tips. Do not blend into the center. Stipple color onto edges only. Apply more lightly to the inner leaves. 32. Run the succulent through steam to set the paint and add a sheen. 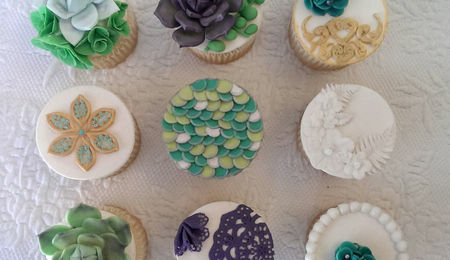 Succulent Cupcake Inspiration Challenge Winner! Thanks so much for the tutorial....these are gorgeous!! Thanks for taking the time to make this tutorial and sharing it with us. Beautiful idea, I do love succulents. Hope to try these soon. Thanks for sharing. Abundance of beauty...gratitude for sharing this technique! Definitely the best succulent tutorial I've seen so far! Thx! Thank you for sharing. 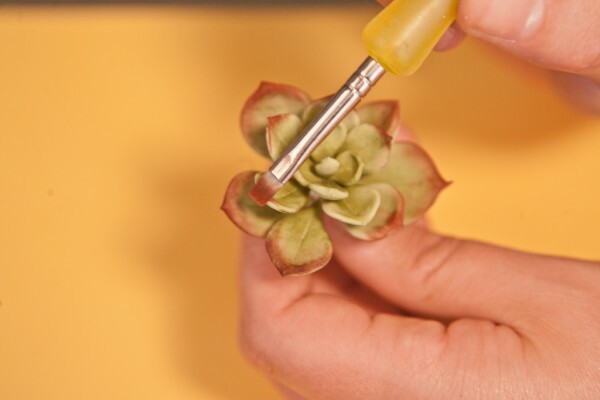 Recently purchased the Succulent cutters and this tutorial is better than the instructions!